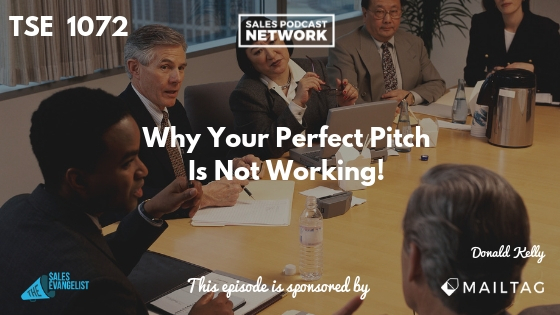 Home » TSE Podcast Post Page » TSE 1072: Why Your Perfect Pitch Is Not Working! Many sellers discover that their perfect pitch is not working because, as they work to build value, they are appealing to logic rather than emotion. We’re devoting the whole month to a discussion about building value, and some of today’s information comes from the book The Transparency Sale written by Todd Caponey. Todd will visit with us on the podcast in the near future, but today we’ll talk about the decision-making process and the role our brains play. Every day, we engage in activities every day that are so routine that we don’t even think about them. When we drive to work, we put a seatbelt on without even thinking about it. When we back the car up, we put our arms over the seat beside us and then look backward. You’re able to listen to this podcast while you’re driving because you don’t even have to think about driving. Todd talks about three levels of the brain, which you may have heard of before. The reptilian part, the limbic part, and the neocortex. The reptilian portion is the core or center, and it’s the oldest part of the brain. It prompts us to do things without thinking. It drives our instincts. It’s the part that prompts us to react to pain without thinking, and it’s part of our survival. The limbic portion is more intricate and it helps deals with feelings and emotions. It helps us make decisions and motivates our behaviors. The neo- or frontal cortex is the newest part of our brain and it’s associated with information and logic. It’s the largest part of the brain and it ties with math and reasoning and justification. We typically show up to our prospect meetings with PowerPoint presentations, charts, spreadsheets, and graphs of all the amazing things our product or service can do. We show up prepared to sell to the customer’s neocortex — the logical part. Remember, though, that the logic part of our brain isn’t where decisions are made. Decisions form in the middle portion of the brain, where our feelings and emotions reside. You must help people make a decision emotionally, and then justify it logically. You can build value as a sales rep by using stories to tap into the emotion or pain that the prospect is experiencing. Unless there is some kind of pain, your customer won’t make a decision. The reptilian part of our brain wants us to stay where we are. If nothing is harming us, why would we move? Leave things as they are. Until someone points out the reason we need to make a change and appeals to our emotion, we’ll never see a need to move. If a seller use emotion to prompt the customer to move and then help him justify the move logically, he’ll be much more likely to make a change. Tie the emotion and the logic together to help your prospects understand the need to make a change. I recently met a guy who sells water filtration systems in Florida. He begins by asking people whether people drink water, and many people say no because it tastes bad and it’s unclean and unhealthy. He points out that taking a shower in the same water can be just as unhealthy because your skin is your body’s largest organ, which presents a pain point for his prospects. The seller never mentions price or facts about his product. He focuses on the emotion of wanting to be healthy. Do it with stories or by asking the buyer questions that tap into emotion. I define sales as helping people persuade themselves to make a change. If we try to persuade them, their guard immediately goes up. Great sellers leave the buyer in charge of the decision. If your demos are flopping or your presentations aren’t working, you’re probably focusing too much on logic. Don’t sell to the logical part of the brain. Sell to the emotional part. Grab a copy of the book The Transparency Sale written by Todd Caponey for more information about the role our brains play in the buying process.